Immediately after his recovery from the wounds of battle sustained at Pamplona, St. Ignatius set out to make a pilgrimage to the Benedictine monastery of Montserrat in Spain. There he spent an all-night vigil before the Black Madonna and surrendered his sword to her. This marked the formal ending to any hopes of a military career and his total dedication to serving Christ under the patronage of Our Lady. It also marked Ignatius’s recognition that his entire life was a pilgrimage—a holy journey to a holy destiny. The word “pilgrim” comes from the Latin “pelegrinus,” meaning “from abroad.” There is something so deeply embedded in the human consciousness that drives a person to travel abroad to a religious site in hopes of spiritual renewal. Thus pilgrimages are common to virtually all religions. We are indeed pilgrims on this earth. We come from God, and when our time on earth has ended, we journey back to God. To set aside time to embark on a sacred journey is to embrace an ancient path of purification by stepping outside ordinary time into God’s time. Pilgrimages invite us to ponder the deeper questions of life: Why are we are here? Where are we headed? How do we get there? I made my first formal pilgrimage as a Jesuit novice. I begged my way to the shrine of Our Lady of Guadalupe in Mexico City, praying for confirmation that the Lord was calling me to take my vows as a Jesuit. Almost 50 years later, I still remember the grace of that extraordinary time in my life. God’s hand guiding my life became so real in my life that I could not doubt it. Since then, I’ve led scores of pilgrimages around the world. I love bringing people to holy sites to discover the rich history of our faith up close and personal. It’s one thing to read about the castle of Loyola. It’s another to actually walk inside it. It’s inspiring to read about the water of Lourdes. It’s extraordinary to bathe in those same waters that have healed so many. It’s a grace to read about Jesus calming the waters of the Sea of Galilee, but the Bible really comes alive if one is privileged to walk along the seashore of the very lake where Jesus spent so much time. Many pilgrimages can be costly and/or physically demanding. But even for those who cannot afford a trip to the Holy Land or who can’t take the time to walk the Camino de Santiago in Spain, smaller pilgrimages are possible. Even a trip across town to a favorite church or cemetery can become a mini-pilgrimage. 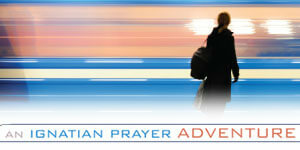 It’s the prayerful intention that transforms a mere trip into a pilgrimage. Pilgrims hold a holy intention before their hearts, so each step of the journey is an opportunity to ponder life’s deeper mysteries. In his autobiography, St. Ignatius referred to himself as “the pilgrim.” This was not simply poetic language. It was for him a daily reminder that, whether we recognize it or not, we all travel upon this earth for a holy purpose. The Principle and Foundation of the Spiritual Exercises reminds us of that purpose—to live in love and grace our whole life long! Today in 31 Days with St. Ignatius, look for God in the Annoying with Cara Callbeck. Follow along every day this month here and on social media with #31DayswithIgnatius. Fr. 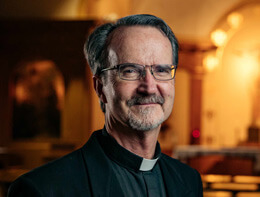 J. Michael Sparough, SJ, is a retreat director, storyteller, itinerant preacher, and spiritual director at the Bellarmine Jesuit Retreat House in Barrington, IL. He holds an MFA from the Yale School of Drama and a Doctor of Ministry from St. Mary of the Lake in Mundelein, IL. A prolific writer and speaker, Fr. Michael has published extensively on prayer. His latest co-authored book is What’s Your Decision? An Ignatian Approach to Decision Making. To view his video reflections, go to www.heartoheart.org. Such a beautiful piece. I love the idea of the mini-pilgrimage. Thank you for the words of inspiration.